So you’ll… what… fly in to Chicago, hire a car, and drive around the 11 cities that have scoop-shops? Almost. I’ll fly to Chicago, drive to nine cities, loop back to Chicago, fly to Los Angeles, but I’ll run (in a pair of Vivo Barefoot shoes) between my hotels and the shops. Some cities have one shop. Some have 4 or 5. Columbus has 10. The total of flying/driving will be around 13,800 miles / 22,200 km. I haven’t worked out the running distances yet (can do that once I have my hotels booked), but a round trip of the Nashville shops alone will be 47 miles / 75. That’s an ultramarathon. I’ve never run an ultramarathon before. Or a marathon. What does the environment think about the reckless petrol and aviation fuel-burning? It’s not best pleased, but I’m aiming to get either a hybrid or electric car, and I’m working with UK Charity Energy Revolution to balance my carbon emissions. They’ll tax me by the mile and use that tax to fund renewable energy projects in the UK and India. And there’s the running between the shops. If the distance is too great (as it might be in Nashville and LA) I’ll take public transport. No Ubers, no Lyfts, no hire car. In addition, I’ll be doing everything I can to reduce my environmental impact; no single-use plastic, eating where possible from shops and restaurants which source their produce locally and ethically, recycling as much of what I use as I can. While the whole thing is frivolous in nature, it’s important to highlight that so long as we exist in the framework of a carbon economy, fun doesn’t need to be compromised for the sake of the environment, and in fact they can run alongside each other quite happily. And in my business (music) we must do more. One of my artists is. Can we follow this idiotic sojourn exciting adventure online? And can we email you to find out if this is for real? Thanks. 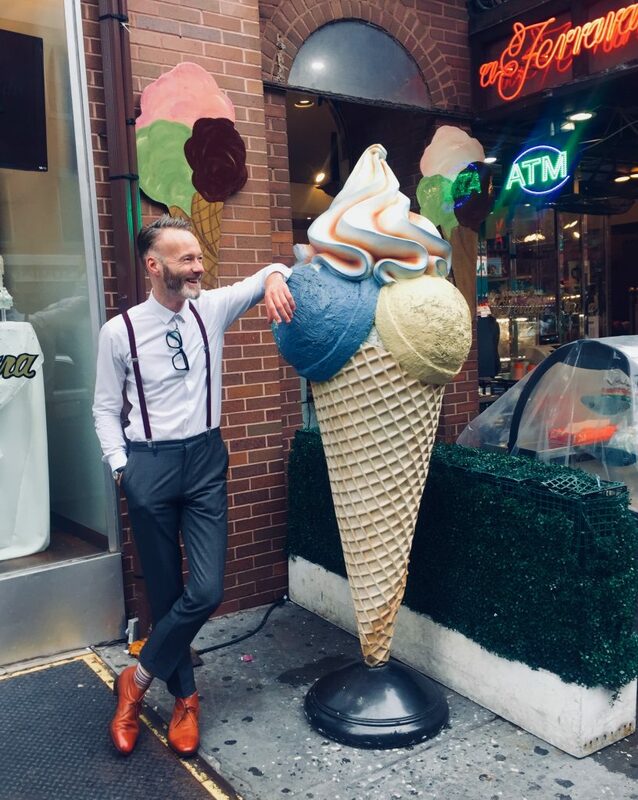 And in order to confirm your credentials, do you have, say, a photograph of yourself standing next to a giant ice cream cone at a gelateria in Little Italy, New York?